San Diego State University (SDSU) Executive MBA courses take place from 8 a.m. to 5 p.m. on Fridays and Saturdays on alternating weeks. The program takes about 21 months to complete, and most students have a 15 to 20 hour workload from classes. The SDSU Executive MBA curriculum requires 48 units of coursework for completion, and students take a set course load each term. Students master core business principles in the first year, whereas the second year provides instruction on business environments, organizations, and decision-making skills. The most recent SDSU Executive MBA class features 35 students, with 42.9 percent female students. About 37.1 percent of the class is of minority status, with 2.9 percent international students. The average age of EMBA SDSU students is 39-years old, who join with an average of 10 years of work experience. The average GPA of EMBA students is 3.34. Current tuition for the SDSU Executive MBA is $68,400, for both in and out-of-state residents. This includes a $500 deposit due upon acceptance. All payments are differentiated between the five registrations during the course of the program. Students may qualify for tuition support via graduate student loans, veteran benefits, or private scholarships. To apply to the SDSU Executive MBA program, students will need to submit an online application, official GMAT or GRE scores, official transcripts, two letters of recommendation, statement of career objectives, current résumé, and business card. Students may also submit a corporate or individual sponsorship form. If necessary, students may submit TOEFL test scores. An application interview is also required. Applicants may request a waiver for the GRE or GMAT if they hold a doctorate from an accredited university, or earned a 3.0 GPA or higher in undergraduate or graduate school. 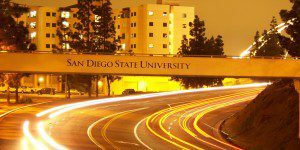 New deadlines dates for the SDSU EMBA have yet to be announced.